Most homeowners and many lawn “professionals” don’t really understand what thatch is. They think it is the clippings that are just sitting on top of the soil, slowly decomposing–but that is not thatch at all. 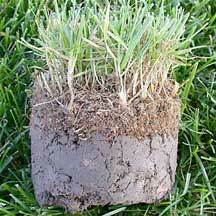 Real thatch is a tightly matted layer of stems, roots, and fibrous material sitting on top of, and preventing your grass from rooting into, the soil. Poorly established sod lawns can turn to thatch very easily, but all grass types can develop thatch when cared for improperly. Thatch is a disaster waiting to happen! If you have a thatch layer it is critical that you handle it as soon as possible, otherwise you will have a very shallow-rooted lawn that is growing into the thatch layer more so than the soil. Summer and winter damage is almost inevitable. And the thatch layer will be a haven for insects and disease. Now that we are in the middle of summer, the problems that come about from thatch conditions are really beginning to show. The matted thatch, where most roots are, will dry out a lot faster than the soil below, causing grass to go dormant quickly. And if watered to lightly, it will hold water like a sponge on top of the soil, which promotes diseases and keeps the roots in the thatch layer. Despite what you may have heard, you cannot eliminate true thatch by raking or other mechanical means. When you try to handle thatch this way, you simply end up tearing out the lawn. The best solution is to get it to decompose at ground-level naturally, through the action of beneficial thatch-digesting soil microbes. An easy way to get this thatch-digesting activity going is by applying the enzymes and microbes contained in our Biological Dethatcher. In summer, when soils are warm, decomposition of thatch with this product will occur faster. Each application should reduce it by up to 3/8 inch. If you are using our All-In-One for LAWNS you are putting on a small amount of dethatching microbes with each application. This is enough to prevent thatch and will slowly get existing thatch to decompose, but it is not enough to handle a bad thatch situation quickly.